Title: Never Enough. Donald Trump and the Pursuit of Success. I didn’t really know all that much about Donald Trump before he secured the Republican presidential nomination. I really enjoyed reading his books and thought he was really likable, especially as we seem to have a fair amount in common: We share the same birthday, neither of us drinks alcohol or smokes, we both built our fortunes on real estate (although he, of course, has made more money from it than I have), we have both written a number of books on success and wealth creation, have both owned modeling agencies, share a taste for beautiful women and both have a keen sense for self-marketing and PR. I hope though that this is everything we have in common. Over the last few months, my perception of Trump has become much more critical, and this biography only served to confirm my shift in opinion. Let me make one thing clear to begin with: This is a critical biography and I do not share the author’s (left-wing) political views, which is why I am unable to agree with a number of his judgements and tendencies. Nevertheless, the book is rich in detail and well worth reading. It is the product of intensive research and countless interviews. The author spent more than ten hours in direct conversation with Donald Trump (who clearly didn’t realize that the book would ultimately be so critical of him). He also interviewed Trump’s three children and his first two wives, and had lengthy discussions with a number of Trump’s closest friends and staunchest opponents. Trump comes from a rich family, the son of a man whose fortune has been estimated at around $200 million. The author never tires of bringing this fact up, and it is clear that he is trying to put different perspective on a number of Trump’s achievements. Whichever way you cut it, it is still remarkable that this son of a rich businessman managed to build a fortune of between four and nine billion dollars, especially given the fact that so many children from wealthy backgrounds struggle to even hold on to their money, let alone grow it to anywhere near this extent. But this is where the questions begin, and the author doesn’t shy away from repeatedly asking: Just how rich is Donald Trump? Trump’s wealth didn’t suddenly emerge as a point of contention when he declared that he would be running for president, it has always been a topic surrounded in controversy. To answer this question you first have to determine the value of the Trump brand name. In 2010, Trump claimed that independent assessors valued the Trump name at three billion dollars (p. 9). At other times, he has claimed that the brand is worth as much as six billion dollars (p. 275). You can argue about which of these figures is closest to the truth until you are blue in the face, especially as Trump is well-known for massively over-exaggerating the extent of his wealth, as the author repeatedly demonstrates. Whether the Trump brand name is worth as much today is another point of contention. I think that his presidential campaign has actually damaged the value of his brand. After all, there are as many, if not more, people who reject his politics, as there are those who support him. The author uses a range of examples to demonstrate that simply applying the Trump name to an asset does not automatically increase its value, as Donald Trump has previously claimed (p. 198). No reader can avoid questioning Trump’s credibility, especially as it is clear that Trump’s tendency to exaggerate has been a recurring theme throughout his entire life. Trump’s habit of boundless exaggeration is one of the qualities I like least about him, in particular as it demonstrates that he has a more than flexible approach to the truth. For example, he once claimed that his company owned 22,000 apartments when the figure was really 12,000 (p. 145). He also claimed that his stake in a real estate development project was 50 percent even though it was really 30 percent. Why? Because, according to Trump, “if the seventy percent owner puts up all of the money, I really own more than thirty percent. And I have always felt I own fifty percent, from that standpoint.” (p. 275). When asked why he exaggerates, Trump replied: “I think everybody does. Who wouldn’t?” (p. 275). In his book, “The Art of the Deal”, Trump admitted: “A little hyperbole never hurts. I call it truthful hyperbole. It’s an innocent form of exaggeration and a very effective promotion” (p. 186). His “little exaggerations” include claims that Queen Elisabeth II (who last visited the USA in1983) asked if she could borrow his helicopter the next time she, “is over in this country” (p. 191). D’Antonio demonstrates that Trump’s exaggerations are often more than just “little” and that they are far less than “truthful”: “In his effort to sell his memoir, Trump’s hype included so many exaggerated claims that tracking them was almost impossible.” (p. 186). The author goes on to describe Trump’s rise as a real estate investor in some detail. His success was largely the result of swimming against the tide, investing in locations that other investors were largely skeptical of – for example in Midtown Manhattan. His success also owed a great deal to the financial leveraging he used, together with the fact that he always secured “non recourse” loans – he was never liable with his own fortune, he only ever pledged the real estate as security against his debts (p. 160). He also entered into a large number of partnerships for his real estate investments, benefiting from his business partners’ creditworthiness. The author also describes in detail how Trump was able to gain the support of New York’s politicians for his projects. Without this kind of ability, no developer can be successful anywhere in the world. Nevertheless, the author paints a picture that raises questions about Trump’s methods. Without actually accusing Trump of bribery or anything illegal, the author creates the impression that Trump was always operating in something of a gray zone. Trump is often hailed as an example of someone who has recovered from bankruptcy, repeatedly rising back to the top again. This isn’t, however, quite true. A number of Trump’s corporations (in particular his casinos) did experience financial difficulties (some even went bankrupt) and Trump also had significant financial problems at different stages in his life, but: “Donald Trump never went bankrupt. He would frequently and energetically assert this in the years after he sought the shelter of the court for his Taj Mahal casino. The filing was made by a Trump corporation, not Trump the man, and he would describe this action as a sensible business move, devoid the shame, that gave him powerful leverage in his negotiations with creditors. ‘You have to be strong enough, not to pay'” (p. 211). Trump, as demonstrated by the author with a number of concrete examples, is a man of contradictions and a man who constantly changes his position (p. 225). 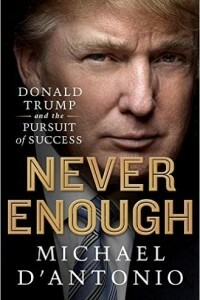 But there is one aspect that has remained constant at every stage of his life – and it is clear to anyone observing his performance throughout his current election campaign: “In almost every case, Trump’s opinions depended on how a person, place, or thing reflected in him.” (p. 225) And when he is attacked, it has always been his tactic to “hit back ten times harder” (p. 277). Trump has always been famous for the same quality that has made him so successful over the last few months of campaigning, but which has also caused him so many problems: His love of provocation. “Trump was willing to say and do almost anything to satisfy his craving for attention. But he also possessed a sixth sense that kept him from going too far” (p. 255). Whether Trump still has this “sixth sense”, or whether it has been replaced by the boundless hyperbole and hubris fueled by his election successes, is something that will determine not just the future of Trump, but potentially also the future of the United States of America. R.Z.